I have this baler and I think that big heavy thing on the PTO shaft that hooks to the tractor is going bad. It seems to be loose in the u-joint area that hooks to the tractor. I don't think it's the u-joint it self. Can I go with a regular PTO shaft? I don't think I will be using to much longer, having my right knee replaced the 2nd of April, don't know how long I have to take it easy. No warranty left. Thanks Jim, I looked around for a little while, didn't see one that cheap, most at least a $100.00 more, still better than a new from Deere. This is the shaft I referred to. Just a thought --- Are you sure you just don't need bearings at the coupler (where the 2 shafts come together)? I ask because my JD 347 sq baler ate that bearing last year. 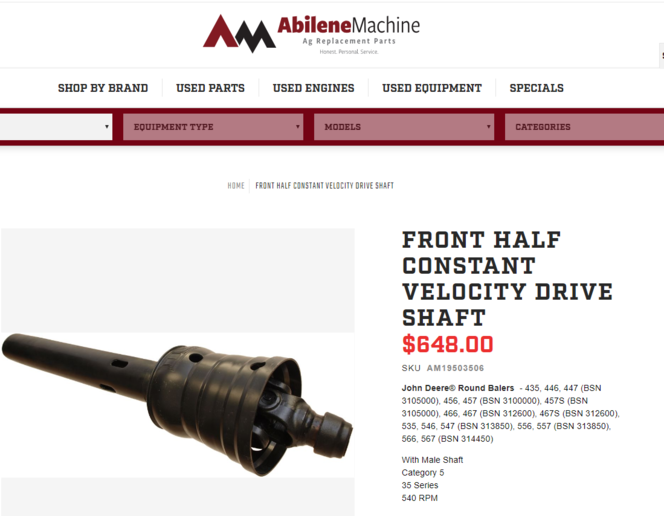 The replacement bearing is way cheaper than a new shaft --- even if you buy from JD dealer. Drive shaft u-joint on JD 347 & 467 are not similar. 467 has CV joint with 2 u-joints very close together with a ball & socket joint. RE TX Jim, do you perform any JD Sq Baler repairs that are brought to you? Need a couple 346's repaired sometime. Sorry I stopped doing any repairs on farm equipment due to my having permanent nerve damage. Most repairs on farm equipment can be performed by anyone with good mechanical skills.Are your 346 balers wire or twine tie? I would be happy to give you any advice you need if you would call me. If interested send me an email & I'll send you my phone # or send me your phone # & I'll contact you.